When working in any big company it is very important to get yourself noticed. If you are unable to do your work well, you will never be able to bag a promotion in the company. Being named employee of the month or employee of the year is never an easy thing to achieve. It takes immense hard work and dedication. If you strive for perfection at all tasks then sooner or later you will surely be given this honor in the work place. 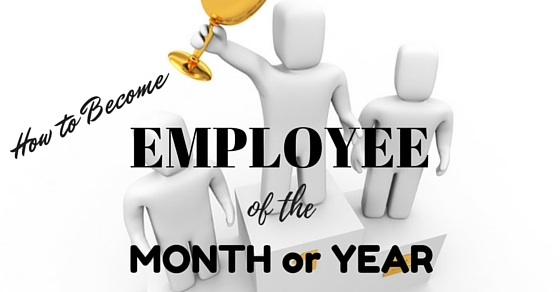 Given here are some of the most effective ways to help you become employee of the month or year in your workplace. In order to be named employee of the month it is vital that you are aware of the requirements which you need to fulfill. If you are unaware of the criteria necessary, then you will be unable to set up any goals for yourself. People always tend to work better, when they have something to work towards. If you are working without any direct motives in mind, you could easily move astray from your desired path. Most companies have a very strict criterion which needs to be met, so do take the trouble to make yourself aware of things. Once you get your facts in place then you get start working to achieve those things. No one who submits sub standard work would ever be named employee of the month. So it is needless to say that if you wish to become employee of the month, the first thing which you ought to do is try and improve your style of work, so that your quality of work automatically improves. If you do your work in an unenthusiastic manner, then no one is going to give you such an honor. This title of employee of the year is meant for those who are able to surpass expectations and perform very well. Even one poorly written report in the entire month, could really ruin your chances of becoming employee of the month. If you want to be named employee of the month, it is vital that you remain mindful of a number of things. Not merely are you to give up good quality work but it is also necessary to come in to work on time and never be late. If you constantly come in to work late then the superiors in the office are going to think of you as someone who does not really care. If you want to get named employee of the month, rather than being late to work you should ensure that you come early. In addition to coming early it would also be great if you could stay after hours and do work which needs to be urgently done. The manner in which you communicate with the clients will really make or break your chances of becoming the employee of the month. Becoming employee of the month is not an impossible thing to achieve, but neither is it something which is easy to achieve. In order to really stand out among the other employees you must ensure that you maintain a good rapport with the employees so when asked about your performance they have only positive things to say about you. If you happen to be rude or dismissive of what they say, you automatically lower your chances of becoming the employee of the month. An employee of the month is someone who can not only do his work efficiently but he also has the ability to help others in time of distress or worry. Going out of your way to help others will really show you as someone who has great character. Not merely is helping your colleagues important but helping your subordinates or new comers is equally important. The manner in which you communicate with them or interact with them will really show what kind of person you are. These new comers are the future of the company so helping them out in time of trouble is surely going to reflect well on you. When working in a top company, one of the worst things which you can do is show up to work looking untidy and unkempt. When you become employee of the month, most often your name and picture will be put up on the notice board. If you do not look presentable then you will not be able to get this much sought after title. This does not mean that you spend a lot of money on the clothes which you wear or the accessories which you buy, just being neat and tidy is what is expected of you at all times. When you dress well, you automatically become more confident, but in addition to that you automatically are able to get more respect. An employee of the month is someone who has been able to brave all odds in the course of the month and really done well under all circumstances. If you wish to be named employee of the month in your place of work, it is necessary that you learn how to deal with unexpected occurrences that might take place on a day to day basis. If you are unable to rise to the occasion then it would be impossible for you to get this title. If you crack under pressure, you will never be able to go very far in terms of your career. If you wish to be named employee of the year, then you need to ensure that you perform well month after month. It is not that you function well only at certain times of the year and at other times you become irresponsible and start letting things slide. Consistency is one of the first things which bosses look at when they are thinking of whom to make employee of the year. This decision is not an easy one to make and they only make it after they have considered a number of different things and taken feedback from various individuals in the company. It is always ambitious people who are able to go far in their career. If you are someone who is lacking in ambition then you will never be able to make it big in life. To be named employee of the year you must show to your seniors that you are someone who is very ambitious and that you will go out of your way in order to achieve what you want. If they do not see that you are ambitious and hungry to achieve more it is unlikely that you will be selected as employee of the year. The company seniors should see you as someone who has not merely great potential but also great drive. If it is your aim to become employee of the year then you must start working towards your goal right from the start of the year. You cannot start working well in the last few months of the year and expect to receive the title of employee of the year. The company when naming someone employee of the year, ensures that the person they are choosing has a sense of loyalty to the company and takes his responsibilities rather seriously. No one likes employees who are badly behaved and do not know how to conduct themselves in a professional manner. Talking to someone who has previously been named employee of the year will really help you to understand what kind of a person you should train yourself to become. After you speak to him or her you need not try to be exactly like that individual, rather you should just try and learn from that individuals positive qualities. The more able you are, the more chances of you becoming employee of the year. Bosses love it when the advice which they give to an individual is taken in the right spirit. If you want to be named employee of the year then it is vital that you learn to take criticism which is given to you in the right manner. If you are someone who takes any criticism personally then it is unlikely that someone like you will be chosen as employee of the year. So try and learn from your mistakes and listen to all advice which is given to you by anyone who wants you to improve. Those who get named employee of the month most regularly go on to be made employee of the year. However, if after being named employee of the month a few times, you start acting in a proud way then you can be sure that such pride is not going to go unnoticed by the managers and the seniors. So show humility at all times and that is going to assure the bosses that no matter what title is bestowed on you, you will never become proud and over confident. Being confident about yourself is a good thing, but being proud is most certainly not. An effective thing which you can try out if you want to become employee of the year, is actually speak to your boss and ask them very directly what are the things they look at when considering someone as employee of the year. Doing this serves two purposes, first is that it will help you know what it is that they are looking for and secondly you can silently communicate to your boss that you are someone who is looking to become the employee of the year in the company. Mostly people with powerful and strong personalities are chosen to become employees of the year. It is unlikely that a person who is shy and timid will be given this title. This certainly does not mean that you become very loud and constantly praise yourself, it simply means that you become someone who has a voice and uses it to air opinions and give suggestions. One of the surest ways to be named employee of the year is by making a lot of money for the company. In the business world, it is only money that matters, so ensure that you bag some big deals for the company. Doing this will really go a long way in helping you become employee of the year in the office. Ask anyone who is working in a company and they will tell you that becoming employee of the month or year is something which is much sort after. In the business world everyone is always trying to make a mark for themselves and if you are unable to deliver on your promises then you will never be able to rise to the top. In addition to this, once you receive a bit of recognition you should ensure that you do not let things go to your head. Nobody likes working with individuals who are proud and insensitive to the feelings of others. When working in a company it is vital to always be mindful of your words and deeds, if not you will find yourself in trouble sooner or later.